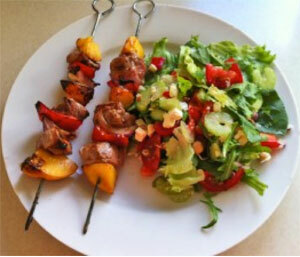 Alternate pork and vegetables on skewers, spray with oil, then brush with sauce. I used a sweet BBQ sauce, but you could use any sauce you like. Cook on BBQ until pork is just cooked. ** You could also use mushrooms, cherry tomatoes, zucchini, etc., or swap the peach for apricot or pineapple. Or change the meat to beef or chicken.